One of the services Omaha Car Transport provides is Military Equipment Shipping. Military Equipment Shipping is a bit different from regular auto shipping. First of all, a company needs special permits to do this kind of vehicle shipping. Second, dealing with military vehicles means heavy loading and unloading. These are tasks that you should only trust to professionals. Also, military equipment is usually shipped between military bases. Car carriers should be able to ship as close to the base as possible, but usually, they are not allowed to enter. Omaha Car Transport can handle it all! We will be happy to help you with shipping your military vehicles. 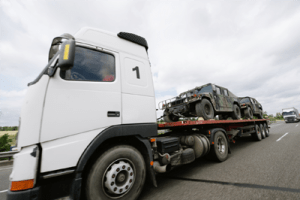 Omaha Car Transport can take care of your military shipping for you. With us, you can move your whole base or just a few vehicles, and we will arrange the move without any hassle for you. We have all the required permits and can ship to any base in the US. We will help you choose all the best options for your vehicle shipping. Our professional team will work on every detail, making sure everything is to your satisfaction. We know Omaha Military Equipment Shipping is a big task, and Omaha Car Transport is up for it. We are also always happy to help military members with their relocation needs. You have a lot to take care of when it is Permanent Change of Station season. We will make sure moving your family’s vehicles will be easy for you! In addition, we even offer special discounts for all military members. This is our way of showing how thankful we are for your service. Military Equipment Shipping rates vary. Contact Omaha Car Transport to discuss all the details and get a free quote from us. We have some of the best rates in the market. Our team is looking forward to handling your Military Equipment Shipping needs for you!